This volume represents and extends the work of a fall 1997 University of California Humanities Research Institute (UCHRI) residential research group on Jewish identity in the diaspora. The group was multidisciplinary; members represented anthropology, art history, comparative literature, cultural studies, German, history, philosophy, political theory, and sociology. General agreement within the group was rare, even on the nature of our topic. The disagreements, however, proved to be a source of great stimulation. This introduction will be something of a roadmap of the terrain covered by our papers. The original galut, as Arnold Eisen points out in his seminal work, Galut: Modern Jewish Reflection on Homelessness and Homecoming, was the expulsion of Adam and Eve from the Garden of Eden.2 Turning from mythology to history, the paradigmatic galut is the dispersion of Israel after the destruction of the second Temple in 70 c.e. The destruction of the first Temple—in 587 b.c.e.—and the subsequent Babylonian exile was calamitous, of course, but that exile lasted only half a century. As Eisen notes, at that time exile could still seem unusual, an exception to the order of things. With the events of 70 c.e. and the subsequent defeat of Bar Kochba in 135, galut became not an exception, but the rule for Jewish life. To be in galut is to be in the wrong place; it is to be dislocated, like a limb out of socket. Indeed, it is tempting to suppose that exile suggests, in Erich Gruen's words, "a bitter and doleful image, offering a bleak vision that issues either in despair or in a remote reverie of restoration. "3 Or, as Bluma Goldstein puts it, it is "a condition of forced homelessness and an anguished longing to return to the homeland. "4 However, whether a view of Jewish identity that emphasizes exile, galut, is necessarily so negative is controversial.5 What is not controversial is that the term exile, as opposed to diaspora, suggests anguish, forced homelessness, and the sense of things being not as they should be. Diaspora, on the other hand, although it suggests absence from some center—political or religious or cultural—does not connote anything so hauntingly negative. Indeed, it is possible to view diaspora in a positive light. Gruen discusses the view that Jews and Judaism requires no "territorial sanctuary or legitimation"; as "the people of the Book, their homeland resides in the text." Diaspora would then impose no special burden. It might even facilitate the spread of the word. Let us turn from the diaspora/exile distinction to the concept of identity proper. If the former is controversial and resistant to analysis, the latter is even more so. As for the controversy, this volume presents the reader with a wide variety of perspectives on Jewish identity. This raises a general question about this controversy, about the multiplicity of views. Are these genuinely competing answers to a single question, about the nature of Jewish identity? Is there such a phenomenon, Jewish identity, about which different theorists proffer competing accounts? Another possibility exists. We might see the "competing accounts" to be expressions of alternative Jewish identities. Such a possibility is suggested by the fact that questions about Jewish identity—like questions about other ethnic, religious, or cultural identities—seem to be largely concerned with the meaning or significance of one's Jewishness. Seen this way, it no longer is tempting to suppose that there is a right answer to the question of Jewish identity, that something or other actually constitutes Jewish identity. Who is to say, after all, that there is only one way in which Jewishness can matter, or legitimately matter? Who wants to get into the business of limiting the ways in which Jewishness might matter. Gruen distinguishes what he calls the gloomy approach to Jewish dispersion, which is more common, from a positive approach. The former resolves diaspora into galut and sees salvation exclusively in terms of homecoming, the reacquisition of a homeland. The latter sees Jews as "the people of the Book," the text as a "portable temple," and restoration to a homeland as superfluous. In the end Gruen suggests that both approaches are too simple, too stark. "The whole idea of privileging homeland over diaspora, or diaspora over homeland, derives from a modern, rather than an ancient, obsession." If we attend closely to the ancient world, another conception emerges. Jewish dispersion, Gruen emphasizes did not begin with the destruction of the Temple in 70 c.e. What Gruen has in mind is not only the destruction of the First Temple and its attendant diaspora. Rather he means to stress that for a host of reasons, largely including voluntary migration, Jews lived outside the Center. Indeed, there was a vibrant diaspora of some three to five million. Jews in the roughly four centuries from Alexäander the Great to Titus. Jerusalem was no more a home for them than it is for many diaspora Jews today. Diaspora communities were stable and had opportunities for residents to take part in the social, economic, and political life of their adopted lands, and often even to gain citizenship. Few of these Jews ever saw Jerusalem, yet it was still their spiritual Center. Never was the sanctity of Jerusalem in question. Indeed, Jerusalem was, in Gruen's words, "the principal emblem of their faith," and "a critical piece of their identity." The tithe to Jerusalem was a ritual that bonded the far-flung diaspora. And they felt great solidarity with fellow Jews, both in the homeland and abroad. If Jerusalem was critical to the Hellenistic diaspora Jews' sense of themselves, what becomes of Jewish identity when Jerusalem is no more? Here galut arguably comes into its own as a touchstone, at least until modern times. In "Coming to Terms with Exile," my own paper in this volume, I explore a Jewish identity for which galut is one central pillar. My contention is that even in modern times, galut cannot and should not be avoided. Rather than steering clear of the almost inbred Jewish sense of dislocation—one that we cannot quite lose even in our own Western diasporic setting—galut must be reckoned with. But such a reckoning does not necessarily issue in a bleak outlook. An ultimately positive take on the human and Jewish conditions requires that we give substantial weight to unpleasant, stubborn facts about human and Jewish dislocation. I distinguish two galut phenomena. First there is in the human condition that I call "normal dislocation." Being the sorts of all-too-human creatures that we are, living in the sort of world we find ourselves in, has always meant big trouble. The second and specifically Jewish galut phenomenon is not normal; it is extraordinary. I have in mind the cataclysmic sequence of events mentioned above: the churban, the destruction of the Second Temple in 70 c.e., the defeat of Bar Kochba in 135, and the attendant dispersion. The prospect of living without the foci of national and religious life must have been experienced as threatening, if not destroying, the very conception of a partnership between God and Israel. The churban, by contrast with normal dislocation, constituted a cosmic jolt. My paper sketches aspects of the Rabbinic response to the cosmic jolt and explores how a tradition smitten by and obsessed with galut develops practices and an outlook to cope. My focus is on a crucial theological aspect of the rabbinic response, specifically the super-anthropomorphizing tendency one sees so clearly in the commentary, Midrash Rabbah, on the Book of Lamentations. This tendency culminates in an anthropomorphic quantum leap, the idea that after the churban, God Himself is in exile; dislocation is cosmic. The outcome is a religious sensibility better equipped not only for history's great catastrophes, but also for the normal travails of the human condition. We turn now to Bluma Goldstein's "A Politics and Poetics of Diaspora: Heine's "Hebräische Melodien. "8 During the first half of the nineteenth century, Central European Jews struggled both to free themselves from the constrictions of the halakha and to become fully integrated citizens. The golden age of Spain—perhaps somewhat idealized in the nineteenth century—served Jewish critics of the oppressive exilic life as the basis of a much more palatable model of Jewish identity. In this context, Goldstein sees in Heine's work an inviting positive conception of diaspora as well as a critique of "the devastating consequences of an oppressive exilic life." Negative images of galut, of exilic life, inhabit the three poems that constitute "Hebräische Melodien." In the first poem, "Prinzessin Sabbat," Heine portrays the miserable situation of the "weekday Jew" imprisoned by traditional ritual. In the second, "Jehuda ben Halevy," the narrator-poet feels the stirrings of the ancient Babylonian exile. The final poem, "Disputation," dramatizes, as Goldstein writes, a kind of exilic "intellectual and cultural immobility." The rabbi and Jews are forced, on pain of death, to defend sterile traditional dogma, though they knew that successful defense of Jewish doctrine may also issue in death. Goldstein's view, however, is that the specter of galut in these poems serves to highlight Heine's suggestion—most fully developed in the middle poem, "Jehuda ben Halevy"—of a different model, that of "an integrative diaspora that promotes interactive dialogue across borders." Heine thus makes available to us the prospect of "integrating substantive aspects of Jewish tradition and secular culture." The result is a picture of diasporic life in which the modern Jew might thrive as a Jew and as a European. One who emphasizes a positive conception of diaspora, as does Goldstein, can readily agree that throughout Jewish history there has been exile, dislocation, and homelessness. But how central to contemporary Jewish self-perception is the sense of ourselves as in exile? By contrast with, for example, my own emphasis on galut, Goldstein directs our attention to an attractive and very different way of construing Jewish identity. In "Dancing at Two Weddings: Mazel between Exile and Diaspora," Murray Baumgarten comes at our subject as does Bluma Goldstein, from a literary direction. His focus is Rebecca Goldstein's 1995 novel, Mazel.9 To a certain point, Baumgarten's treatment of galut and diaspora parallels that of Bluma Goldstein and to some extent Erich Gruen. Galut is characterized by powerlessness, halachic constriction, dislocation, and anguish, in contrast with the diaspora's possibility of empowerment and integration. Baumgarten reads Mazel as identifying the movement from galut to diaspora with the Emancipation movement from the shtetl to the city. But here is the twist: Mazel goes farther than the movement from shtetl to city. It is the story of four generations of Jewish women, beginning in the shtetl (Shluftchev), proceeding to the city (Warsaw), winding its way through Israel to New York, and ending in the suburbs (Lipton, New Jersey). This suburb, largely populated by the traditionally religious, is no more than "Shluftchev with a designer label," as Sasha, the central character, puts it. Baumgarten sees this movement to the suburbsñit involves both Jews and, if Baumgarten is correct, a new direction in Jewish writing—as subtle and complicated. The city promises a newfound and heady freedom, spontaneity, and meaning born of enjoying the prizes of modernityñin Warsaw "there were so many ideas in the air you could get an education simply by breathing deeply"ñbut it is incapable of providing salvation.10 So Baumgarten reads Mazel. Warsaw is, as Baumgarten says, "but another stop in the long Jewish journey of homelessness." This is, of course, not to say that the life of the shtetl provided salvation. As noted above, its shortcomings are legend. But Baumgarten emphasizes the complexity of the shtetl: It was a bounded and constricting world, but at the same time dream-like (as suggested by the name Shluftchev, which roughly means "Sleepy Hollow"), possessing the "completeness of meaning of a classical work of art." Think here of a Mozart symphony as opposed to a twentieth-century atonal work of striking spontaneity. The world of Warsaw was more open and as Baumgarten says, "clangorous," with subtle but blaring meanings. Another aspect of the shtetl was that it was "a world desperately trying to articulate and safeguard, in a polluted, corrupt environment, a space of sacredness even at the cost of obsessive behavior." Thus Baumgarten locates the power of the shtetl, deadening as it may be. The ultimate destination—ultimate for now—is the suburb, a context that appropriates values of both shtetl and city. Not that the suburb represents a smooth assimilation of those values and virtues; there is no Hegelian synthesis, as it were. Indeed, Baumgarten notes that his title, "Dancing at Two Weddings," intimates both the impossibility of a synthesis and the power of the pursuit. Many of Mazel's central characters are unable to abandon either world. They are caught between exile and diaspora. This leads to something to which most, perhaps all, members of our research group could agree: Jewish Emancipation allowed and even encouraged the transformation of the constricting shtetl version of exile into something more creative, open, and cosmopolitan. That much seems relatively uncontroversial. But, while agreeing with this, some would argue—there are suggestions of this in Baumgarten's paper as there are in mine—that there is in the newfound worldliness something of a new form of homelessness, of rootlessness, one that has been widely shared since the advent of modernity. As we will see below when we discuss Louise Tallen's essay on baalot teshuvah, this homelessness has taken its toll and sometimes leads to a desire to reengage with at least some of the values of the shtetl. The costs of Emancipation are illuminated from another direction by art historian Catherine M. Soussloff in "Portraiture and Assimilation in Vienna." Soussloff sketches the history of Jewish portraiture and points out that assimilation, one of the effects of Emancipation, issued in portraits of Jews in which there are no overt signs of their Jewishness. This was so in colonial and federal America as well as in central Europe in the eighteenth and nineteenth centuries. But to deny Jewish content to such portraits—and Soussloff's work is pioneering here in its identification of Jewish content—is to abstract these portraits from their historical and social contexts. It is also, argues Soussloff, to fly in the face of both recent work in museum studies and a historical interpretation of art. Soussloff's contextualism views portraiture as a transaction between the artist, those who sit for the portrait, and the audience. A crucial component, stressed by Soussloff, is the placement of the work of art. The portraits in question, free as they are of overt Jewish content, were viewed in the parlors and living rooms of emancipated American and European Jews. The portraits thus represent an ideal of assimilation, "unmarked," as Soussloff says, "by dress, no longer residents of the ghetto." But viewed in context—including both their social history and their placement—these portraits signify both the desire not to signify their subjects' Jewishness, and at the same time (and for this very reason) their subjects' Jewish identity. That Emancipation engendered assimilation is, of course, a commonplace. And that portraits of assimilated Jews abstract from the ethnic and religious dimensions is no surprise. Soussloff's provocative point is that the same assimilationist tendency is at work in the interpretation of the art. Writers about portraiture have participated in what Soussloff calls the ethics of assimilation. They view the portrait as if it were simply an image, something contained in the picture frame. Soussloff's emphasis is not simply the visual product, but on portraiture itself, and she sees this as occurring "along an axis perpendicular to the image's frame." Emancipation not only leads to assimilation, but it also contributes to the adoption of a universalistic—context-insensitive—view of art. The papers thus far have explored Jewish identity in ancient or modern Western diasporas. As noted, one important agreement between the essays is that there is no single account of Jewish identity, no uniquely privileged Jewish identity. The lesson is brought home with force by Daniel J. Schroeter in his study of a non-Western diaspora, "A Different Road to Modernity: Jewish Identity in the Arab World." Indeed, as Schroeter explains, there is no single story even for the Arab world, though the multiple Asian/North African Jewish identities are unified by shared contrasts with western Jewish identities. Schroeter explores the meanings and effects of modernity for the Arab world generally—not only with respect to Jews. For example, the development of the modern nation-state in the Arab world was quite a different affair than that in Europe. In the former, the nation-state is somewhat artificial. The earlier rise of Islam as both a political and religious entity meant that, by contrast with the Catholic Church in Europe, "the Muslim community, the umma, never had to define itself in relation to the state." This changes with the Ottoman Empire in the nineteenth century and even more so in the later Colonial period. These political movements attempted to establish a civil society, but the enormous influence of the Muslim past meant that secularism never took hold as it did in Europe. Accordingly, even with the rise of the Arab nation-state, the hold of religion and the cohesiveness of religious minorities remained strong. Unlike Europe, Arab lands never developed a secular common ground. Jewish assimilation thus was not a major threat to Jewish identity and survival. The lack of a secular common ground is also related to the lack of a pressing need felt for religious reform. Thus one does not find any analogue to Reform Judaism in the East. But where there is no Reform, there is also no Orthodoxy. (Orthodoxy here does not refer to a rigorous commitment to traditional religious practice, but rather to the movement that arose in Europe to counter Reform.) In the East one does not find the tension that existed in Europe between the demands of traditional Jewish religious practiceand technological innovation and secular education. The rabbis could be more relaxed about modernity; it was considerably less threatening. Similarly, Zionism was not needed to fill the gap left by the move from shtetl to city, the meaning-gap left by the rejection of the old ways. Zionism thus arose not as an all-embracing new modern Jewish identity but as one thread, sometimes an important one, among many; a new aspect of a more smoothly and slowly evolving Jewish identity. In Europe, modernization dismantled the virtually self-governing Jewish kehillah [community], and granted citizenship to Jews. This in turn had a dramatic impact on Jewish identity. A Jew became, Schroeter writes, "a German or a Frenchman of the Hebrew or Israelite persuasion or faith." The rise of colonialism and its attendant weakening of Jewish self-government in the East often had a dramatically different outcome, in part due to the factors mentioned above, such as the lack of secular common ground. Jews largely continued to maintain strong attachments to local community and local religious practices. Schroeter's essay raises important implications for the concept of diaspora. Consider Moroccan Jews living in Israel. The category "Moroccan Jew" is not one that Jews applied to themselves in Morocco. Given the linking of the modern Arab nation with Islam, it was implausible for Jews living in Morocco to identify themselves as Moroccan. They were Jews whose home was Morocco; Home was another matter. Indeed, their situation is in some ways similar to that of the more comfortably assimilated Hellenistic Jews described by Erich Gruen. Jews living in Morocco were certainly members of a Jewish diaspora, but unlike the Hellenistic Jews, they emigrated to Israel in significant numbers. Such people saw Israel as their new home, but Morocco—especially their local community, with its distinctive modes of Jewish practice—was also their home. Israel, partly because of its powerful Ashkenazi roots, was still another diaspora for its Moroccan Jews. Like Jake in Diane Wolf's narrative, discussed below, they live in multiple diasporas. Let's turn to the effects of recent history on Jewish identity. To what extent has the experience of the Shoah been formative?11 This is a question both for those people who have been directly affected by it and for those most removed from the horror. Can the identity of a late-twentieth-century Jew not be affected by the Shoah? Similarly, can a contemporary Jew's sense of himself or herself be unaffected by the existence of the State of Israel, the first politically autonomous Jewish entity in millennia? No doubt for many Jews, the State of Israel constitutes a factor in self-perception. But how important a factor is it, and what precise role does it play? The historian Irwin Wall addresses these questions in "Remaking Jewish Identity in France." One thing that is striking in Wall's paper is the central place he gives to another thesis upon which there was universal agreement within the research group. Any attempt to locate anything like the correct account of Jewish identity, or the correct Jewish identity, is bound to failure. There isñand from the ancient world there never has beenña single or uniquely correct Jewish identity. One is reminded of the old joke concerning n Jews and n+1 synagogues. Wall gives primacy of place to this insight. Both in postwar FranceñWall's main focusñand elsewhere, one can find many pegs on which to hang one's Jewish identity: the consciousness of a shared history; a sense of Jewish community as having survived all manner of disasters, most notably the Shoah; a sense of solidarity with the State of Israel; minority status vis-à-vis Christianity; the political and cultural prophetic tradition of social justice; solidarity based upon shared language (Hebrew, Yiddish, Ladino); finally and quite prominently for some, traditional Jewish religious identity. Wall strongly criticizes views of identity that fail to observe this multi-identity stricture, for example, the "essentialist" characterizations of non-Jewish thinkers like Sartre and Lyotard who attempt to fashion an identity for Jews from the outside. As Wall explains, Lyotard "characterizes the Jews as the quintessential other. . . . [they] have the role of remaining in exile and spreading the word of Kant to the world." The Jews of France, Wall insists, fit no such neat picture. Wall's project, particularized to France, is that of finding significance in one's Jewishness. How is this to be done? How or where is one to find the elements to remake a contemporary Jewish identity in the diaspora? There is a sense in which this question is already answered once one notes the multiplicity of contemporary Jewish identities in France. If there is such a multiplicity then somehow French Jews have found a way to construct such identities. But Wall's question goes deeper. He is worried about the plight of those largely secular Jews for whom Jewish identity is problematic. At the heart of his worry is the sense he shares with Alain Finkielkraut that the two most prominent candidates for pillars of Jewish identity, the Shoah and the State of Israel, are in the end unsatisfying. To make the Shoah a pillar is unsatisfactory since this would, in effect, make Jewish victimization focal. This, as Wall notes, would be a poor substitute for a rich identity. Solidarity with Israel is unsatisfying to the contemporary French Jew since it depends on a perception of the justice of Israeli policy, risky in a country whose foreign policy is so often pro-Arab. What makes Israel an even shakier pillar is the increasing polarization in Israel of the religious—read "Orthodox"—and secular. Where then is the secular French Jew to turn for a rich Jewish identity? Wall discusses a number of modern French thinkers who have addressed the issue. Two of the most prominent, and the two in whom Wall is particularly interested, are Finkielkraut and especially Finkielkraut's teacher, Emmanuel Levinas. Finkielkraut's own ambivalent position is quite telling. On one hand, he feels a powerful sense of being a Jew. His Jewishness, Wall says, is "proclaimed from the rooftops with pride." But Finkielkraut himself cannot discern any real content to this sense of identity. It is an identity without substance. Finkielkraut's somewhat quixotic idea that the revival of secular Yiddish culture might constitute a real basis for a diaspora Jewish identity. The only remaining native speakers of Yiddish, however, are the Hasidim, hardly advocates of secular Yiddish culture. For Wall and the French thinkers he explores, the project is to unearth something from the history of Jewish culture that might engender Jewish renewal. This is significant—and highlights something controversial among our contributors—since it suggests that what is in hand at the moment in the Jewish cultural or religious repertoire will not suffice. The most powerful voice in favor of such an approach—his voice extends considerably beyond France—is Levinas, a prominent French philosopher and critic of Husserl and Heidegger. Levinas reaches out to the Talmud, specifically to talmudic ethics, recast through his "Greek," that is, Western, lens. His interest is not in full-blown Jewish religiosity, but in abstracting and to some extent reconstruing the ethical insights of rabbinic Judaism. The problem with talmudic ethics as a pillar of Jewish identity for the diaspora is the inaccessibility of Talmud to all but its Orthodox students, who approach it in quite a different way than does Levinas. The situation is parallel to that of Finkielkraut's dilemma with Yiddish—the language is owned, as it were, by Hasidim who are not interested in Finkielkraut's secular agenda. Where Wall contends that the Shoah cannot underpin a rich, contemporary identity for most Jews, Diane Wolf, in "'This Is Not What I Want': Holocaust Testimony, Postmemory, and Jewish Identity," presents a case study of a survivor for whom the Shoah is indeed central. Wolf's subject is Jake, a Polish Hasid, for whom a bitter taste of galut, rather than an empowering diaspora, is pivotal to his sense of himself as a Jew. Wolf speaks of "collective memory," the product of the transmission of a group's history and culture from one generation to the next. Collective memory, she argues, is crucial to individuals' identities as members of the group and products of its culture and history. Since the Shoah figures centrally in recent Jewish history, it has become a crucial component in the transmitted collective memory. Wolf draws on Jake's postwar life to accomplish two goals. She illustrates the difficulties that characterize the lives of many survivors. For Jake the end of the war marked the beginning of injustices created by family members. Wolf's other goal is to demonstrate that the methods used in Spielberg's Shoah Visual History Foundation can undermine the richness of survivors' stories, while perhaps encouraging a Jewish identify based on victimization. A more nuanced oral history, one that examines the reactions of Jewish kin and the Jewish community, might yield a richer set of images. Jake's testimony is powerful, moving, painful. The story begins with Jake as a young Hasidic boy in Poland, a classic galut. It moves through the Shoah with the horrors of concentration camps and a death march, to still another galut in upstate New York. It is difficult to consider oneself in exile if one lives the privileged lives that most of us lead. For Jake, however, it was as if the universe was constantly reminding him that he was in the wrong place. He and his wife—survivors who met and married right after the war—relocated to New York State to be near his wife's few living relatives, only to find that these relatives exploited them economically and in many respects treated them worse than strangers. A devout Jew, Jake was unable to practice his religion as he wished, as his relatives/employers required him to work on Shabbat and on holidays. The long hours he worked left him little time for his family, which was especially painful for him, having grown up in a world where family was of primary importance. Only once did his (almost sweatshop) work hours permit attending his son's baseball game; he arrived as the game ended. Jake's life in America, writes Wolf, was thus multidiasporic. In prewar Poland, Jake was like Gruen's Hellenistic Jews in diaspora: Jake's home was Poland even if his Home was Jerusalem. His later life in America—hardly experienced as the "goldenah medinah"—was one of dislocation, not because of a religious yearning for messianic times or places, but rather simply because America did not work for him. This is not to say that it was a vale of tears, that he lived a miserable existence. Wolf is careful to present a balanced picture. His was in many ways a success story. He is warm, lively, optimistic, and humorous. He eventually owned a successful business, raised two children who became professionals, and is an active member of the Jewish community. At the same time, Jake has lived his life in a palpable galut; indeed, sometimes in several at once. Wolf's discussion, like Daniel Schroeter's, thus directs attention to the phenomenon of multiple diaspora, but in a very different context. In "The Ideology of Affliction: Reconsidering the Adversity Thesis," Bernard Susser is concerned with victimhood. The "adversity thesis" maintains that anti-Jewish prejudice and oppression have been the key to Jewish identity and survival over the last millennium, at least in the Ashkenazi world. Susser is happy to advocate the adversity thesis when it is restricted to the pre-Enlightenment period. Indeed, for much of Jewish history there has been a kind of marriage between adversity and theological ideas, specifically the dominant theodicy that sees suffering as punishment for waywardness from God. Jewish religious thinking has thus made sense of and given meaning to Jewish suffering. In return, oppression has given power to, even confirmed, as it were, the theological ideas. This worked well for a timeña long time. Indeed, oppression, given its theological interpretation, served to foster solidarity and survival. But the Enlightenment, with its support for religious skepticism, and post-Shoah developments—specifically the character of Western, democratic, pluralist societies—have caused trouble for the adversity thesis and the marriage of theology and Jewish oppression. To begin with, once the theodicy loses its grip, oppression no longer has any clear or specific significance. Once we stop thinking of oppression as punishment for our waywardness from God or as purification on the way to messianic liberation, it can come to mean many different things. Perhaps it has no special significance at all. In any case, adversity no longer automatically yields group solidarity. Indeed, oppression may encourage assimilation, a "massive silent exit." The problem posed by post-Shoah political developments is that the historic reality of Jewish adversity is, in Susser's view, dramatically diminished. Many Jewish communities in North America, Europe, and Israel are flourishing, and Gentile oppression seems a remote possibility. If adversity was a central element of Jewish identity, then once the reality of political tolerance and pluralism rises to consciousness, the "Jewish ethno-religious civilization would need to undergo fundamental reformulations." Nevertheless, Jews still very much have a sense of themselves as embattled. Susser writes, "Embattledness as an instinct has outlived embattledness as a reality." Adversity has been "reified . . . transformed into a static mental picture that is independent of its empirical referent." Susser makes Jewish victimhood central in historical and contemporary Jewish identity. This might appear to be at odds with, say, Finkielkraut and Wall, but there is a deeper level of agreement. Susser thinks that there is not much more to Jewish identity—at least for the nonreligious American Jew, his main focus—than the sense of himself or herself as part of an embattled minority. But this is to describe the current state, not to advocate an ideal. The deeper level of agreement is that Susser, no less than Finkielkraut and Wall, maintains that adversity will not support a rich, contemporary identity. Adversity, no longer theologically significant for many and increasingly incongruous with Western realities, will surely not support long-term Jewish survival. Survival is clearly a more central focus for Susser than for many of the others represented here. Jewish identity is, thus, doubly problematic for Susser. First, because it has not liberated itself from its traditional association with adversity. This outdated picture stands in the way of the development of a positive one that can give significance to Jewishness. But second, even if we could throw off the burden of adversity, how might we construct a significant Jewish identity? What might replace the enormous role of adversity? Susser ends his paper with what one might think of as Finkielkraut's problem: If one isn't a religious Jew or an Israeli, what rich content can there be to one's Jewish identity? One has the sense that Susser is not optimistic about Jewish survival outside the ambit of Orthodoxy and the borders of the State of Israel. Along the way, however, Susser raises important questions about the positions he defends, questions that the reader may want to ponder. First, is it so clear that historically the adversity thesis has played such an enormous role? Susser alerts us to the dangers of reducing a major cultural tradition to a mere defense mechanism or social reflex. One might suppose that there is more to Jewish identity—pre- or post-Enlightenment—than the instinct to circle the wagons. Second, Susser feels that Western civilization has turned a corner in regard to Jewish oppression. Nevertheless, he wonders: Given the facts of the Shoah and its cultured German perpetrators, indeed, given the events of the last decade with harrowing images of ethnic cleansing, dare we suppose that humanity has come of age? The anthropologist Louise Tallen, in "Jewish Identity Writ Small: The Everyday Experience of Baalot Teshuvah," emphasizes, as does Susser, that for many American Jews, Judaism is hardly at the core of their identity. It is one facetñoften a rarely surfacing oneñof who they are. But there is a countervailing tendency that is the subject of Tallen's paper. Tallen's study concerns formerly secular Jewish women who have become Orthodox Jews, baalot teshuvah, through the outreach efforts of Chabad Lubavitch Hasidism. Despite the emphasis in our culture on self-actualization and freedom of choice, Orthodoxy—even Chabad-style Orthodoxy, which involves great sacrifices in personal autonomy—is staging something of a return. For increasing numbers of Jews, Jewishness has become a focal element of their identity. Tallen is interested in identity formation, a process that she sees as usually taking place below the level of consciousness. Her focus here is in people who undergo radical life changes, since in such cases the process of identity formation and negotiation becomes conscious, as it also does, says Tallen, for those living in cultural margins. Here we can perhaps obtain a glimpse, even a model, of what we all do unconsciously. The baalot teshuvah in Tallen's study typically experienced a sense of "not fitting in" in their earlier lives. Some were troubled by experiences with organized Judaism or with a Christian-dominated society. Some were seeking meaning after growing up in families troubled by divorce, traumatic deaths, or mental illness. They report a sense of betrayal and/or disillusionment before their finding their new Orthodox lifestyle. For these people, embracing Chabad-style Orthodoxy made the difference; they found a home and the beginnings of a meaningful identity. Leaving the old ways of being in the world, however, and embracing and maintaining the new is almost always painful and difficult. Specifically, it is difficult to unlearn the old ways and values, to shed, as Tallen says, "an ill-fitting but sticky identity." And then there are inevitable conflicts between one's personal desires and the communal ideals. Many of these conflicts, Tallen suggests, are of the kind every individual facesñthe need to mediate a compromise between self and community. This is at the heart of identity construction and reconstruction. Other difficulties arise from the Chabad community itself. Tallen explains several respects in which baalei teshuvah, both men and women, are not quite accepted as full-fledged members of the community; they bear a stigma. They thus occupy a "borderland, caught between secular and religious worlds, unable to fully enter the religious world and still feeling the pull of the secular world." The reader will want to ponder the obvious connection with Murray Baumgarten's discussion of the modern Jewish plight, the need to dance at two weddings at once, the inability to abandon either of two incompatible worlds. Ironically, Tallen's baalot teshuvah stand modernity on its head; it is the modern and postmodern world from which they are running. And it is a world of considerable constriction they enter. The papers in this volume range over a variety of views of Jewish identity and, indeed, a variety of identities, as well as a variety of diasporas. But the myth of an essential Jewishnessñand the related idea of an essentially unified Jewish peopleñdies hard. Our volume concludes with the art historian Kerri P. Steinberg's contribution, "Contesting Identities in Jewish Philanthropy." Steinberg directs our attention to the reluctance of mainstream Jewish philanthropies to allow for the reality of Jewish diversity. Steinberg contrasts the univocal conception of Jewish identity that informs the work of the Joint Distribution Committee (JDC), the overseas arm of the United Jewish Appeal (UJA), with the emphasis on diversity of the New Israel Fund. Her project is to scrutinize the photographs that appear in the 1995 annual reports of these funds. These photos, reproduced in this volume, with their different portrayals of donors, philanthropic officers, and recipients, present the contrasting conceptions of identity. The UJA sprang into existence in January 1939, the offspring of the merger of the JDC and United Palestine Committee as a response to Kristallnacht. The UJA thus represented the unification of competing American philanthropic interests. Accordingly, built into the fabric of the UJA is an impulse towards unification as a way to resolve crises, an impulse that in the past has been highly effective. By contrast, the NIF began in the late 1970s, a response to the social, cultural, and intellectual upheavals of the 1960s and 1970s in Europe and America. A central concern was the desire for social justice in Israel and peace in the Middle East. From its inception, it has been a joint effort of Americans, Europeans, and Israelis, and tends to attract more progressive donors. Steinberg analyzes the visual culture of each organization as revealed in their annual reports. The JDC photos prominently portray donors and officers—the latter sometimes in formal portraits. The report thus pays tribute to the American donors, but it often leaves the beneficiaries anonymous. The JDC photos also correspond to mainstream American Jewish notions of social progress. The underprivileged are often shown as being Westernized and modernized. The NIF photographs, by contrast, emphasize cultural differences and the subjects' autonomy. Donors do not appear. Instead we find profiles of casually attired activists involved in a variety of causes supported by NIF funds. Tribute is paid to those fostering social justice in Israel. Further, compared to the JDC's more journalistic style, the NIF's photos are artistic and compelling. There is thus the implication that donors have something of an artistic sensibility and that issues of race, gender, and class matter to them. Again and again, the JDC photos return us to the influence of American Jews and to its conception of progress. Clearly, argues Steinberg, there is an agenda here to propagate the myth of Jewish unity. Although in the past such a myth has functioned for the organization, perhaps the myth has outlived its utility. Indeed, Steinberg associates the insistence on a univocal portrayal of Jewishness with a yearning for an essence that unites Jews. The NIF is, of course, not without its own agenda. This is revealed by an emphasis on diversity, on the marginalized, and by the polemical character of some of the NIF photographs, such as one of women studying traditional religious texts. Steinberg concludes that where the photographs of the JDC portray difference as opposed to sameness, for the NIF "difference is recast into a softened motif of diversity." Where are the Hittites? Why does no one find it remarkable that in most world cities today there are Jews but not one single Hittite, even though the Hittites had a great flourishing civilization while the Jews nearby were a weak and obscure people? When one meets a Jew in New York or New Orleans or Paris or Melbourne, it is remarkable that no one considers the event remarkable? What are they doing here? But it is even more remarkable to wonder, if there are Jews here, why are there not Hittites here? Where are the Hittites? Show me one Hittite living in New York City. Such ironies are easily multiplied. Woody Allen suggests that there ought to be still another Jewish holiday, this to commemorate all the promises that God broke to the Jews. More seriously, there is the specter of a people of whom many considered themselves chosen by God, subjected to millennia of horrors. Perhaps the ultimate and most painful irony is that of the Shoah, perhaps the greatest of those horrors, inflicted by a modern nation of otherwise truly high culture. But the ironies of post-Enlightenment Jewish identity are as notable. We might begin with an example of a Jew who sees no point in his Jewishness and wants out. Indeed, cultural/religious/ethnic identity can be constricting. But often at least, getting out is no trivial matter. One has limited control over how others think of one, and many such people cannot escape thinking of themselves as Jews who want out. Next—a kind or ironic variation—there is Finkielkraut (and he is not alone in this) who in a way also sees no point in his Jewishness, but declares his Jewish identity from the rooftops. Then there is the case of the Israeli Moroccan Jews, who never thought of themselves as Moroccan. There is Heine, who converts to Christianity only to later write with great passion and warmth about the Jewish experience. There is the irony of those steeped in post-Enlightenment culture returning to traditional religious practice, Louise Tallen's baalot teshuvah being a striking case. My argument in my paper, that galut be seen as a pillar of a contemporary religious Jewish identity furnishes another example, emerging as it does from an post-Enlightenment outlook for which supernaturalism is problematic. And irony is underscored by Murray Baumgarten's image of the postmodern Jew as attempting the proverbially impossible: dancing at two weddings. As with the ironies of Jewish history, these ironies may be easily multiplied. For the ironically inclined, Jewish identity, as Jewish history, provides a gold mine. The members of the fall 1997 research group at the University of California Humanities Research Institute wish to extend special thanks to the institute's then director, Dr. Patricia O'Brien, and to her wonderful staff for their especially generous hospitality and for providing the sort of context in which our research was able to flourish. We are also grateful to the Lucius N. Littauer Foundation for making it possible for Israeli scholars Asa Kasher and Bernard Susser to participate with us. Diaspora, considered as a context for insights into Jewish identity, brings together a lively, interdisciplinary group of scholars in this innovative volume. Readers needn't expect, however, to find easy agreement on what those insights are. The concept "diaspora" itself has proved controversial; galut, the traditional Hebrew expression for the Jews' perennial condition, is better translated as "exile." The very distinction between diaspora and exile, although difficult to analyze, is important enough to form the basis of several essays in this fine collection. "Identity" is an even more elusive concept. 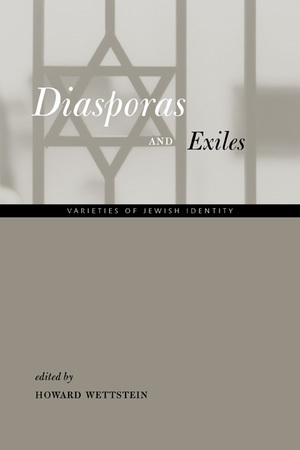 The contributors to Diasporas and Exiles explore Jewish identity—or, more accurately, Jewish identities—from the mutually illuminating perspectives of anthropology, art history, comparative literature, cultural studies, German history, philosophy, political theory, and sociology. These contributors bring exciting new emphases to Jewish and cultural studies, as well as the emerging field of diaspora studies. Diasporas and Exiles mirrors the richness of experience and the attendant virtual impossibility of definition that constitute the challenge of understanding Jewish identity. Howard Wettstein is Professor of Philosophy at the University of California, Riverside. Author of Has Semantics Rested on a Mistake?, and Other Essays (1991), and of the forthcoming The Magic Prism: An Essay in the Philosophy of Language (2003), he is an editor of the philosophical annual, Midwest Studies in Philosophy. 3. A Politics and Poetics of Diaspora: Heine's "Hebraische Medodien"